With Spring just around the corner, the market season is starting to rev up for it's busy season. Rug up, get out and support your local crafting community. The Craft Hatch Market is on Saturday 13 August 11am-4pm, At 1000 £ Bend on Little Lonsdale Street in Melbourne. "Craft Hatch is Melbourne's best incubator market, showcasing the work of student and emerging designers. Craft Hatch is a unique opportunity for anyone to purchase the freshest, hand-made products direct from the designer, including homewares, jewellery, clothing, accessories, stationery and more." Perth Upmarket is having it's Wedding Upmarket this Saturday 13th August, 2011. Showcasing local designers, offering DIY kits plus handcrafted jewellery pieces. Head to www.perthupmarket.com.au for all the details. The perfect way to end the week is with a twilight market. This Friday 5pm to 9pm, the Mamma's Market is on at Buderim War Memorial Hall, Buderim on the Sunshine Coast. Focusing on 'lovely things for home & family'. Craft Markets Australia's Mornington market happens at the racecourse on Sunday from 9am to 2pm. A large market with a large variety of handmade stalls. Do you want more? 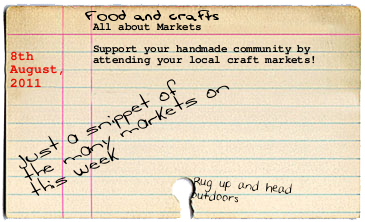 Sign up at Market Angel to receive updates and news on markets that are happening in your area. Finished my very first bag today. I've published on the blog.